If you're looking to hire a London magician, you've come to the right place. Christopher Howell provides several types of magic, including close-up magic and after dinner shows as well as corporate magic shows for events of all sizes. A Member of the Magic Circle, he is a magician on hire for diverse events - whether for the private booker or corporate event market. 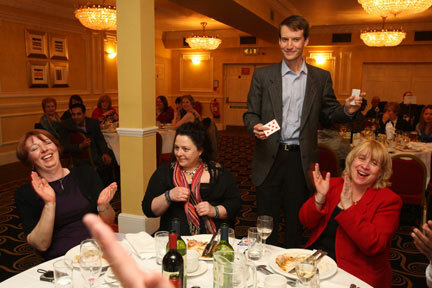 Apart from being a memorable way to create a buzz, you can hire Christopher as a close-up magician as an excellent way to break the ice and get the event started on the right note. His performances get guests and delegates mixing while he offers them something fun to talk about. What kind of magic should you hire?